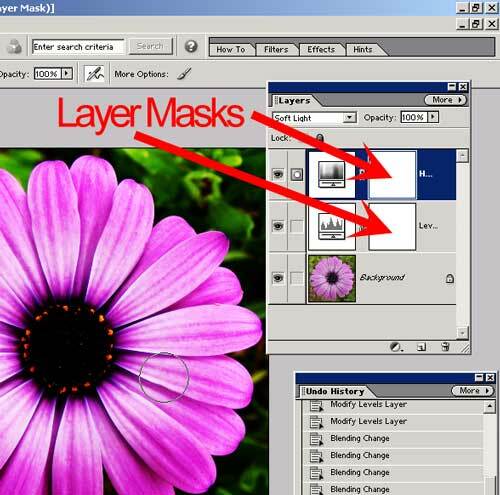 Layers are the most powerful tool in Photoshop and Elements - they allow non-destructive editing that can be tweaked and changed until you're happy, with no worries about damaging the original image. We've played with Levels and Hue adjustment Layers to change the overall contrast, brightness and colour of our images, so now lets explore what happens when we vary the blend mode of those layers. Fire up Elements or Photoshop, open up your image, and apply a new levels adjustment layer (the little circle with black and white in it, at the bottom of the layers palette). 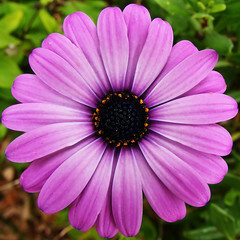 In my image there's a pretty clear black point near the middle of the flower, so I grab the black point colour checker and sample in the bit that should be black. 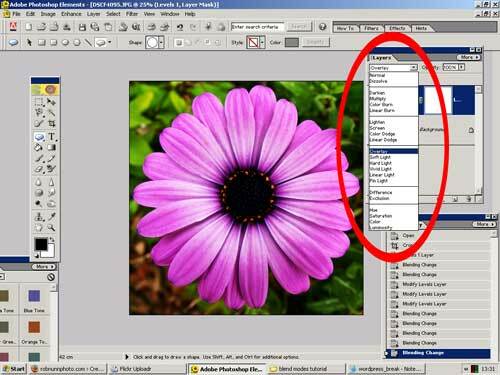 You may have a true black, white or grey point, so use the colour pickers to set those points. Remember, if you're not happy with the change, simply press your "alt" key, and "cancel" will turn to "reset", so you can start again. 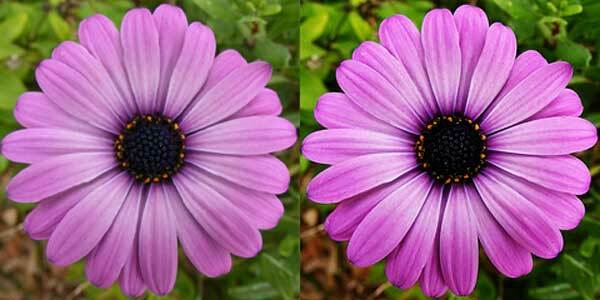 Adjust the black, middle and white point sliders to add a little more contrast. When you're happy press OK.
Before we go any further, a quick explanation of layers and blend modes. Layers are like simple clear plastic acetates that we put over our starting image, so we can make changes that are editable and don't ruin the original. Wow! What a great change, and so simple to do. Another cool thing about adjustment layers is that you don't have to play with the sliders to have an effect - just change the blend mode, but you can go back and change things if you want to. Also remember that we can change the opacity of the adjustment layer (top right of the layers palette) to tone down the effect. This is probably too strong, so I can adjust the strength by changing the opacity of the layer. 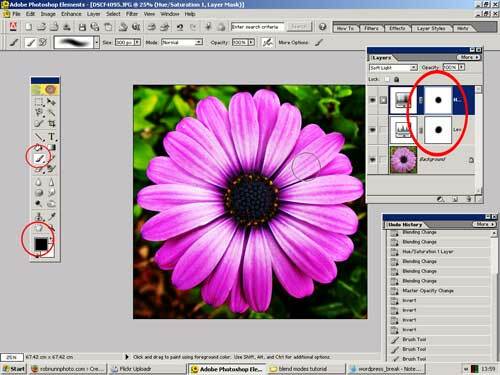 When a layer mask is white, it allows the adjustment layer to effect the image below. If its black, it blocks the effect of the layer mask. 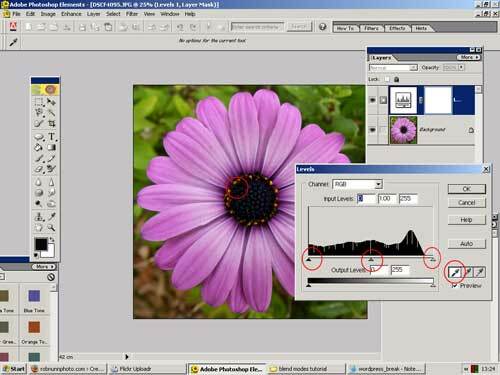 To show this, select the layer mask by clicking it, then press "ctrl I" on your keyboard - the layer mask with turn black, and the image will change. Press ctrl I again to get the layer mask back to white. So, next time you apply an adjustment layer in Photoshop or Elements, whether it be levels, contrast, curves, hue, etc, try a different blend mode - you'll be amazed by the richness and saturation you can achieve. Great tutorial, I'm off to try this right now. I have never been able to make any sense out of the Blend Mode names. Do they really mean anything? A few of the blend mode names relate back to film processing - the easiest way to learn them is by playing around with images and by seeing how different blends change your image, or different parts of it, especially if you mask out the parts you don't want.